Our newest infinity love knot anklet is a perfect choice in ankle bracelet jewelry for an uncomplicated and sophisticated look. The combination of two different sterling silver chain types gives our anklet for women both unexpected texture and added interest. Two thin beaded chains link together with two thin snake chains to form an infinity love knot. Our sterling silver love knot ankle bracelet secures with a lobster claw clasp. Our anklet measures 9 inches and boasts a one inch extender for a perfect fit every time. 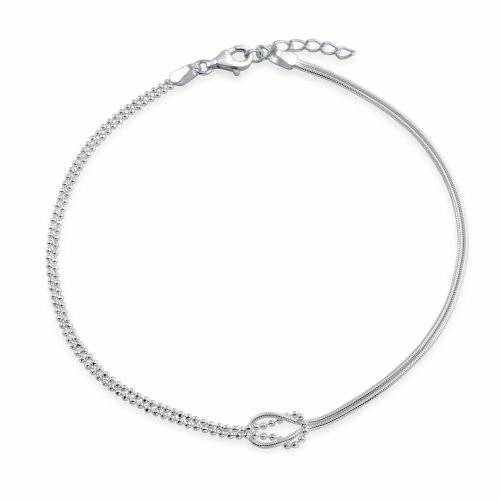 Be prepared to shine with this sterling silver ankle bracelet on and help to enhance your sophisticated style. Buy this infinity love knot anklet for someone you love as a romantic gift and add an eye catching look to any ensemble.